We are situated on the prestigious Lindfields residential development. Quiet, yet only a few minutes from Disney and the Interstate 4 which is the main road to all the major attractions and the airports. Sleeps up to nine people, plus 2 cots with ease, plus a pull-out, sofa bed in the living room can sleep two more people. Four bedrooms (two master suites), three full bathrooms, fully air conditioned with ceiling fans throughout, cable TV in all bedrooms, TV, DVD, and video in family room, large heated pool (15-feet by 30-feet) with extended pool deck, full-sized screened pool enclosure (will not affect your suntan!) also hot tub with 52 hydrotherapy jets, luxuriously furnished throughout, telephone with FREE local national and international calls, there is a COMPUTER WITH FREE HIGH SPEED INTERNET, XBOX & PS2 games machine 7ft american pool and air hockey for you to use. Close to Interstate 4, 192, and only five miles from Disney attractions and close to Universal, Orlando, and other major attractions. New celebrations and championship golf courses nearby. This property has been fully refurnished. We are Nick & Gill Atkins & we live in Great Steeping, Lincolnshire, England, where we have owned and run a successful MOT garage for over 25 years . We are a large family with 5 children, now adults ,and 18 grandchildren !!! 4 dogs, cats , chickens ,pigs etc... Because we have had this house several years and own it mortgage free, we will still be here when others may have had to sell, so your dream holiday plans are safe. Because of all the children in our lives realised the need for something that combines both luxury & family holidays so we have tried to equip our villa with lots of little extras not normally found in rental properties that make life comfortable, fun and special. All these EXTRAS are lent free of charge including a computer with wifi internet access, dvds,videos,games, toys & baby equipment and we do ask that our guest respect our property. Our villa is fully furnished to a high standard and smoking is only allowed in the pool area and lastly we wish you a happy & enjoyable vacation where ever you choose to stay Nick & Gill Atkins and family. We visited Florida a few years ago and decided to buy our own home here. As we have 5 children & now grandchildren we wanted something that combined both luxury & family holidays we have therefore tried to equip our villa with all the little extras that make life comfortable for adults and fun for the children. our villa has been equipped with everything that you would need to have a great vacation we have asked for your feedback and have acted upon it and that is why our villa has such a homely feel to it you tell us it is like home from home. Quite neighborhood. Great house for a large family. Great for the money. Hope to stay again. Owner will get right back to you. This was my family's 2nd time staying at this property. The last time was 6 years ago. This time I came with my hubby and our 2 daughters (age 10 & 4) and another family (husband, wife, and daughter age 6). Why I love this property.... the fenced in backyard, the heated pool, the hot tub, and all the EXTRAS that make the stay with little ones so much easier and feel like home. Coming to Florida with two adult couples the 2nd master suite was great so no one had to decide who got the master suite. All of the girls loved the "kids" room (bunk bed room). Plenty of toys to play with and tons of books for bedtime stories. I forgot about all the extras and packed our stroller but really there was no need. There were 2 strollers, car booster seat, highchair, and pack n' play. We love staying here because it has that lived in feel that you want to have when traveling with kids. It keeps those "Don't touch that, you might break it" moments to a minimum. The kitchen is filled with anything you could possibly need: coffee pot, tea kettle (electric and stovetop), tons of bakeware, pots and pans, plastic storage containers, and handy gadgets. The house is located only about 15 minute drive to all Disney park parking areas, which makes it even better. The girls loved coming home after a day at a park and hopping in the pool for a few while we prepared a late dinner. They loved the pool lighting at night. And after the kiddos headed to bed the adults took advantage of the screened in porch area and hot tub, a perfect way to rest those achy feet from all that walking. I also can't say enough how easy it was to work with Nick & Gill. Even though they live "across the pond", they were always quick to respond back to any messages I sent them from the time I requested a quote until we checked out. They were a pleasure. We love this home and can't wait to come back again for our next Disney adventure. My family loved it....Especially the kids! We loved this property. It was a very cozy home in a very quiet neighborhood. The pool/air hockey table was a plus.The outside was nice, we really enjoyed the hot tub and pool. 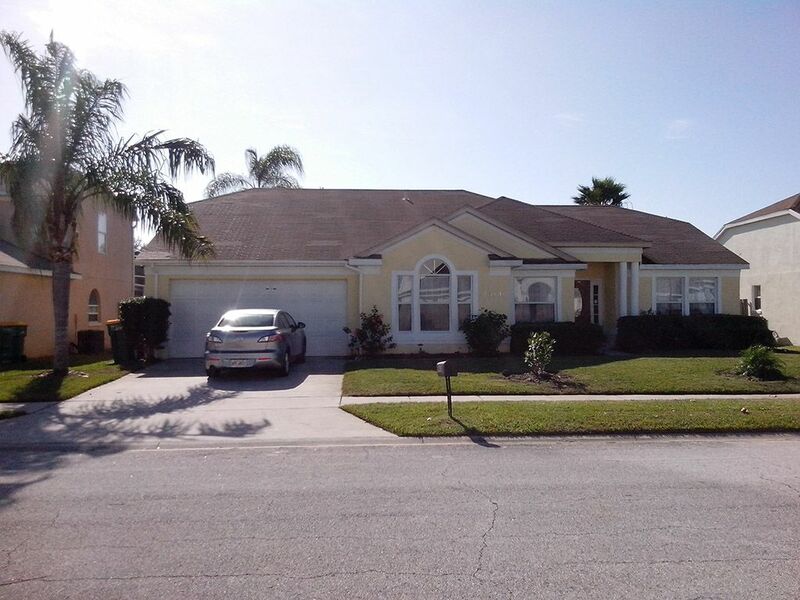 It was located within minutes from Disney, other attractions, stores, and eateries. I would recommend this property to family and friends. The house is well equipped with TV's and not only WiFi but a computer as well. There were loads of personal touches - cots, toys, safe etc. which made it home from home. There is a hot tub under the Lanai which was great fun for an hour or so on a couple of days when the weather was cooler. The bedrooms were a good size although I hadn't realised that one of them was in a garage conversion and was down a step after going past the washer and dryer. The property was very clean on our arrival. Some aspects of the house are showing a little age but all was serviceable. We had a need to contact the managing agent and our comments were readily taken on board and acted on promptly. While there were plenty of chairs on the pool deck there were only two sun loungers which were just about adequate for our needs but could be an issue for a larger party. Lindfields is a great area, near enough to the parks for convenience but far enough away to be able to relax from the hustle and bustle. As Orlando is one of THE holiday destinations you will find attractions to suit any taste. One restaurant to mention is Ace Plus Chinese on the 192, their buffet is excellent - well worth a try. We stayed at the villa in March 2010 - everything was perfect!!! The kids loved the bunk beds, lots of toys and the home was so clean. We can't wait to return!! !